This book is free on Amazon 7/1/2017 - 7/5/2017! • What existed prior to the beginning of time? • Why was the universe created? 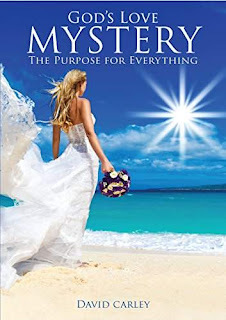 • What is God’s love mystery? • What are the seven stages of God’s love mystery? • Where do humanoids and dinosaurs fit into history? • Why were you born? • Why does God allow evil to exist? • How did the Church fall from grace into legalism? • Where is the best Church for you? • Was the Old Testament God vengeful or loving? • Do Christians and Muslims worship the same God? • Will all mankind eventually be in heaven? • Is accepting Christ necessary for salvation? • What is prophesied to occur in the immediate future?